This is believed to be the oldest brick building in New Mexico. It sits at the southwest corner of Mesilla plaza. The sign on the front wall gives a quick history of the building. “This is the oldest documented brick building in New Mexico. 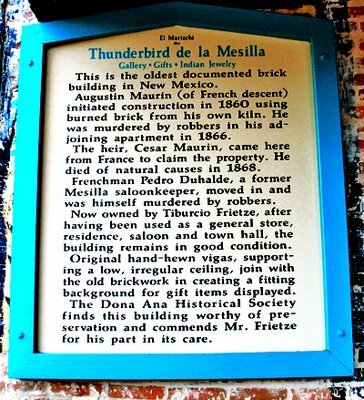 Augustin Maurin (of French descent) initiated construction in 1860 using burned brick from his own kiln. He was murdered by robbers in his adjoining apartment in 1866. The heir, Cesar Maurin, came here from France to claim the property. He died of natural causes in 1868. 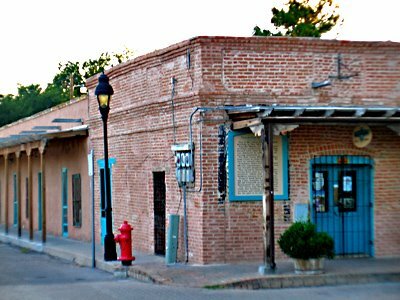 Frenchman Pedro Duhalde, a former Mesilla saloonkeeper, moved in and was himself murdered by robbers. Now owned by Tiburcio Frietze, after having been used as a general store, residence, saloon and town hall, the building remains in good condition. Original, hand-hewn vigas, supporting a low, irregular ceiling, join with the old brickwork in creating a fitting background for the gift items displayed.